ANAHEIM, Ca. – The Los Angeles Angels aren’t very good again. This time it’s pitching. Who knows what it’ll be next week, as the Angels’ maladies have been something of a moving target in this, the season of their reputed renewal. Remember, the madhouse ticket lines had given way to the vanishing offense and a startlingly untidy April, and then the Angels became the league’s most capable team when rookie Mike Trout saved them all. It was enough for a while, too. Not just Trout, of course, but he had a knack for pulling the game along with him, making them all better and covering for some of the stuff that wasn’t going as well. That’s when Albert Pujols was hitting and so was Mark Trumbo, and it seemed the Angels had survived the worst of what they could be. Except they arrived at Angel Stadium on a Monday night in mid-August to a languid crowd, arms folded and cheers muted. The Angels hadn’t won so much as a series in three weeks. They had lost eight of 11 games, and five games in the AL West to the Texas Rangers. Squarely in third place, the division title probably lost already, the Angels suddenly had an entirely new issue, that being a pitching staff would be worst in the league since the All-Star break if not for the moribund Cleveland Indians. As of Monday afternoon, the offense was the best in the AL over the same period. And still the Angels were being buried by the Rangers, had been passed by the Oakland A’s, and were in a fight for that one-game postseason do-or-die with half the teams in the league. Other than Jered Weaver, the starters – including newcomer Zack Greinke – have lately bordered on lousy. That, in turn, has exposed a thin bullpen. 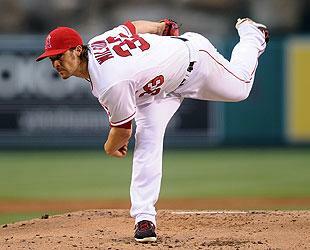 The Angels have one win from a starter in August, and five losses from their relievers. Dan Haren was on the disabled list because of a sore back, Ervin Santana has suffered periodically from a sore elbow, C.J. Wilson has endured ailments that include a blister, cracked fingernail, stiff back and achy knee. On Monday night, Wilson allowed three runs in 6 2/3 innings to the Indians, and even that small achievement was lost in the game’s result (Indians 6, Angels 2), another bullpen implosion and the fact Wilson left with a bruised pitching hand. He’d attempted to field a line drive without the benefit of a glove. These are the little issues that come with a season and try a franchise’s depth. The Rangers have had worse. The New York Yankees, too. The A’s have three starters on the disabled list and Brandon McCarthy just returned from it. But the Angels allow 78 runs in 11 games, then six more to the Indians, pull a 5.25 ERA over five weeks, and this is the sort of thing even a stadium full of foam Trout hats can’t solve. The general manager has tried. Jerry Dipoto went and got Ernesto Frieri on May 3. He added Greinke at the deadline. They line up Weaver-Greinke-Wilson-Haren-Santana, and that should do, right? They’ve pitched for some time now in name alone. That leaves them to pitch themselves back toward reasonable results, or soon August will be gone and so too will be the season. Wilson was slightly better against the Indians, still lost, and still has an ERA of 6 over the past month. He held up his left hand afterward. The swelling, he said, had subsided. X-rays were negative. He seemed to believe he would pitch when his turn came around again. “Our thought process is, ‘OK, it’s going to turn around. This is the game, this is the at-bat, this is the inning,’” Wilson said. They’d gone into this mode once before, back when the season was new and nothing seemed to go right. Maybe it’s different when the season is three-quarters old and your record seems a reasonable indicator of who you are. Today, after 116 games, the Angels are mediocre. “It’s slipping through our fingers a little bit,” Wilson said of recent games, not necessarily of the season. But, then, there was a point to be made there, too. That would have the Angels win 30 of their final 46 games. As the man said, at least.